For me, having an interest in natural products brings with it more awareness for the environment. I am certainly no hippy tree hugger but I like to make an effort where I can. I wanted to bring to your attention an environmental issue which goes hand in hand with why natural products are better for you. I read online that microbeads in exfoliating products are found in our oceans and are threatening the marine wildlife. Microbeads are those little balls of plastic in an exfoliator that help you scrub away the dead skin cells. Problem is they are not biodegradable. It will be no surprise to hear that companies use them because they are cheaper than natural alternatives like oatmeal, apricot and walnut husks. 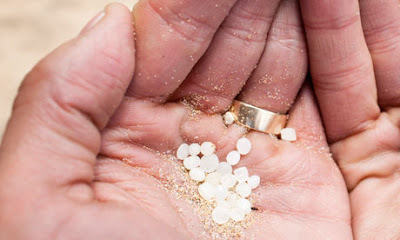 This week Unilever, who owns brands Dove, St. Ives, and Alberto VO5 announced it will phase out polyethylene scrubbing beads by 2015. In the meantime, next time you choose a body or face scrub check the ingredients. Think about it's impact on the environment as it washes down the drain. Even if you choose not to avoid parabens and SLS, make sure the scrubbing grains are from a natural plant source. I agree, better for the environment as well. Personally I don't exfoliate very often due to having eczema. I think they cause unnecessary damage to the skin. Some products on market are extremely harsh. I use scrubs occasionally as I agree they can be too harsh. Walnut is abrasive I use oats they are gentle and great for eczema sometimes I find salt can irritate. It's so easy not to think about where products go once you've rinsed them down the drain. I now use AHA to exfoliate with now, but if I was still using scrubs this post would have definitely stopped me. Wow like many of the other readers of this articles I was totally unaware this topic. Thank goodness people like you and I love and prefer using natural products. Face scrub wise my all time favourite is the ila spa face scrub for glowing radiance and it uses crushed blackcurrant as the exfoliant. I highly recommend you try it, it's my latest review on my blog infact so I am glad you mentioned about this. Great for finding plastic free scrubs.